I keep telling myself that I need to get over this whole Twilight thing—-you know, the books and the movies and fandom in general. I’m not the target audience . . . there’s no way I can stay excited through 4+ movies . . . this *has* to get old at some point. . . .
And I just want to *SQUEEEEEEEEEEEEEEEEEEEEE* until June 30th. Seriously. An army of newborn vampires emerging from the depths of a lake? The incredible Stacey Jay is BACK on the blog for the third time since 2009, because Miss Thang is celebrating the release of yet ANOTHER novel: MY SO-CALLED DEATH. Stacey totally wins the award for the most frequently discussed person on my blog, because I think she may have surpassed Johnny Depp by now. It might be a tie for Tim Gunn, though. Just because you don't have a pulse doesn't mean you can't be perky. One second, freshman Karen Vera's on top of the most fabulous cheer pyramid ever. The next, she's lying on the pavement with seriously unflattering cranial damage. Freakishly alive without a pulse, Karen learns that she's a genetically undead zombie. Suddenly, Karen's non-life is an epic disaster. She's forced to attend a boarding school for the "death-challenged," her roommate is a hateful wannabe-Goth weirdo, and she's chowing down on animal brains every day to prevent rot (um, ew?). Even worse, someone is attacking students and harvesting their brains for a forbidden dark ritual. And it might be the hottest guy at DEAD High, the one who makes Karen's non-beating heart flutter! Armed with a perky smile and killer fashion sense, it's up to Karen to track down the brain snatcher and save her fellow students from certain zombie death. Stacey Jay is a workaholic with three pen names, and a sick sense of humor. She loves creepies, crawlies, and of course, romance. What would a zombie novel--or any novel--be without kisses that make your toes tingle? Stacey has been a full time writer since 2005 and can't think of anything she'd rather be doing. Her former careers include theatre performer, professional dancer, poorly paid C-movie actress, bartender, and waiter. Me: What was the inspiration/where did you get the idea for this latest story, and when did you realize it could become a novel? Stacey: I was writing the sequel to YOU ARE SO UNDEAD TO ME and I started wondering what life was like for a zombie who wouldn't go back to his grave. Was there zombie school? What did they do there? MY SO CALLED DEATH grew from there. Me: Now that you’re a seasoned author, if there is one thing you could go back and tell your “debut author” self, what would it be? Stacey: Get it right during copy edits because people are going to get angry if you start mucking around with your words too much during the First Pass Pages--the final read through before the book gets ready for print. Me: Good advice! I’m always looking for new ways to tackle revisions. What is your tried and true revision strategy and why does it work? Stacey: I like to print out my revision letter and then mark things off as I address them. I go through point by point and then go back and do a full read-through to see if any of the things I've added, shifted, or deleted need to be altered to correct the "flow" of the book. It usually works...except when it doesn't. Lol. Revisions still tear me up every time. It can be hard to re-imagine a story that's already set in your head. Me: That sounds like a good plan, because sometimes it works . . . and then it doesn’t. Thank you so much for stopping by, Stacey! 1. We had this long, surreal, cold winter. Freezing temps (for North Carolina) and three, yes, THREE separate snowfalls. (This is especially surreal, because we’ve gone some years without a single flurry). It was too cold for me, so this 70 and 80 degree weather is just what I ordered. 2. I played golf for the first time this year on Thursday. It’s been a while . . . I don’t think I played at all last year because of my work schedule. I decided to take a day off, though, and head out with the DH to play a round. It was a great afternoon, and while I’m kind of pathetic at golf, I’m glad it’s something we both enjoy and can do together. It was pretty warm outside, though, which leads me to . . .
3. I am *so* sunburned. It started on Thursday. I wanted to even out my farmer’s tan, though (and get rid of the glove line on my left hand), so I went out for about an hour yesterday (Saturday) to read on my back deck. One hour was all it took. I’m so SPF 8 for the remainder of the season, and I’m glad vampire pale is in. It sure beats this magenta hue I have going on right now. 4. There is pollen EVERYWHERE! When you look outside, there’s this yellow haze in the air. It’s on the trees and the roads and the cars. I’m thankful I don’t have allergies. I’m sorry for those of you who do, because it’s bad, I know. We could use a good rain shower; at least everything would return to its normal color. 5. 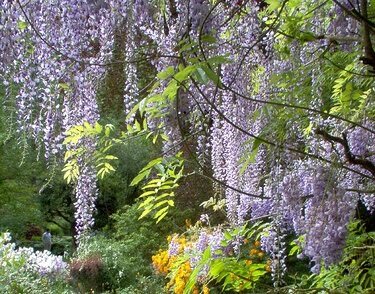 One of my favorite flowers is wisteria. I *love* them. I actually used them in my wedding because they remind me of grapes, and I was marrying an Italian-American, and, well, they’re just so darn pretty. They come with the pollen, so I’m enjoying our drives through the country right now, because the vines are everywhere. 6. We spent time with the family today coloring Easter eggs. Cheers to my brother, who just turned 24 and wins the award for the deepest, darkest eggs, because he was the only one patient enough to wait thirty minutes for the dye to take. Cheers to my grandma, who stops by every year to help us hide/find eggs. Undoubtedly, we always spend more time looking for missing eggs than anything. Today, we got to 11, and there were five missing. I don’t know how many times we circled that yard, trying to remember where they were hidden. We always get to the point where we decide that we’ll smell the egg in a few days, anyway, so it really doesn’t matter . . . but then, miraculously, all the eggs appear.